Charlotte, N.C. (AP) — Jordan Spieth felt like he was “free rolling” coming into the PGA Championship, the only major keeping him from the career Grand Slam. He just didn’t anticipate greens rolling like this. On some of the fastest, frightening and at times frustrating greens the PGA Championship has ever seen, Kevin Kisner and Thorbjorn Olesen emerged with a share of the lead Thursday at 4-under 67, the highest score to lead this major after the opening round in seven years. Spieth didn’t make a putt longer than 5 feet — that one was for par — and was coming off a pair of three-putt bogeys from long range when he steadied himself with a pair of perfectly executed birdies for a 72 that left him five shots behind and very much in the game. For all the talk about this 7,600-yard course favoring the big hitters, the shortest club in the bag turned out to be just as valuable. “Any time you have a putt down grain, downhill … we just tap it and hope it stops by the hole,” Jon Rahm said after a 70. U.S. Open champion Brooks Koepka led five players at 68. Koepka missed a half-dozen putts from 12 feet or closer, and while it looked as though he hit the ball well enough to go low at Quail Hollow, he wasn’t the least bit frustrated. That’s the way Kisner approached it. It helps that he grew up in the South and loves Bermuda greens. 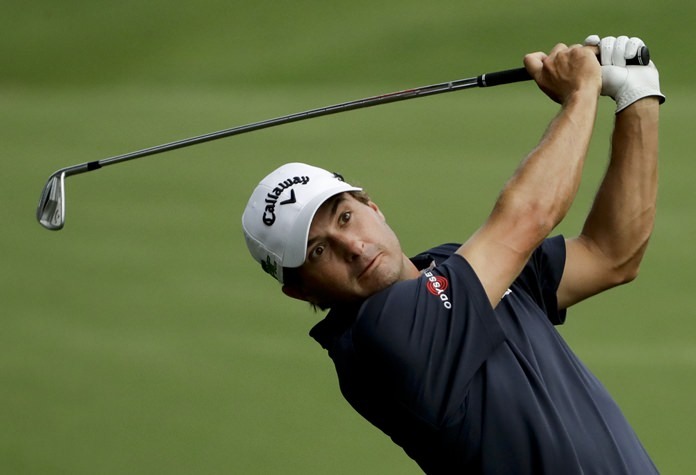 Given the size of Quail Hollow, Kisner drew up a simple plan. He identified four or five holes where he could make birdie, and he played for par everywhere else. The 18th was not one of the birdie holes he had in mind, especially with his ball nestled in the Bermuda rough 205 yards from the pin. Kisner thought the grass was thin enough behind the ball to get a 5-iron on it, and from there it was a matter of judging how much it would bounce. It ran up to the green about 20 feet away, and he used that rhythmic putting stroke to trickle it into the cup. Olesen picked up birdies on most of the same holes, and he finished with a 30-foot birdie that also sounded like an accident. Rickie Fowler made plenty of birdies, and he needed them to offset his triple bogey on the sixth hole. Rory McIlroy, the betting favorite coming into the week because of his two victories at Quail Hollow, was motoring along just fine when he birdied the 10th hole to reach 2 under, just two shots behind. One swing changed everything. He hooked his tee shot into the water on the reachable par-4 14th, had to drop in nasty rough and missed a short putt to make double bogey. He failed to birdie the par-5 15th and closed with three pars for a 72. Hideki Matsuyama, Dustin Johnson and Jason Day were among those at 1-under 70. Quail Hollow played to an average score of 74.7, making the PGA Championship look like the toughest test of the year in the majors. The PGA Championship typically features good scoring because it’s held in August when water has to be kept on the greens to keep them from dying. Spieth failed to take advantage, and while he could appreciate they were tough to putt, he had a good day off the tee. That was his main concern. As for the pressure of trying to get the final leg of the Grand Slam? At least he was still in the game. Phil Mickelson failed to make a single birdie — the second straight major that has happened — and shot a 79, his worst score ever in the PGA Championship. Ernie Els, who might be playing his final PGA, matched his worst score in the championship with an 80. He also shot 80 when he was 22, playing his first one at Bellerive in 1992.